Doctors: IUDs Deserve Another Look : Shots - Health News Intrauterine devices for birth control got a boost from a leading group of obstetricians and gynecologists. In new guidelines to doctors, IUDs were deemed the most effective, reversible form of birth control. When it comes to birth control options, women have tons to choose from. 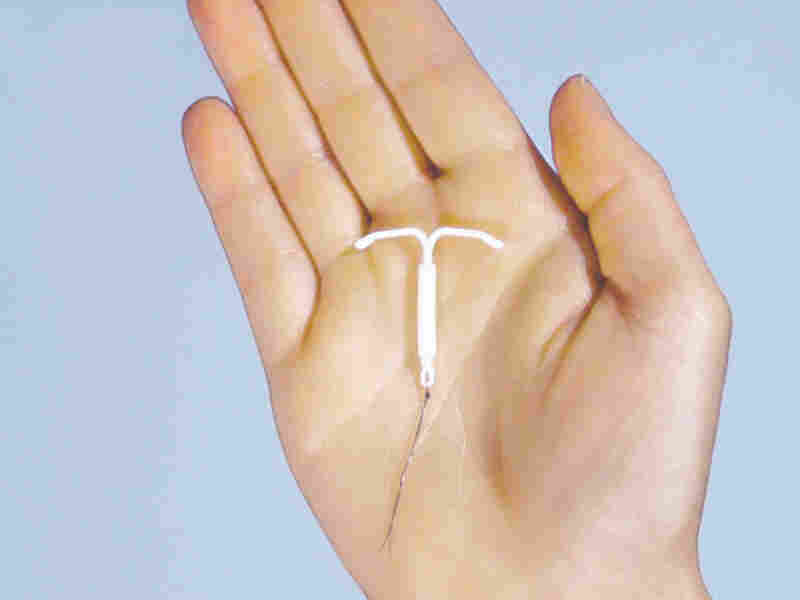 The Mirena IUD made by Bayer. So it caught our attention when the American College of Obstetricians and Gynecologists came out with guidelines advising doctors and patients to consider intrauterine devices, which are inserted in the uterus to prevent pregnancy. A big reason: The guidelines say IUDs "are the most effective reversible contraceptives" available. There are two three IUDs — Paragard and Mirena and Implanon — on the market in the U.S. In the past, IUDs have gotten a bad rap for side effects, such as bleeding, infections and infertility. That legacy has been a factor in their relative unpopularity. Today, IUDs are overshadowed by other contraceptives, such as the pill and the patch. Among women using some forms of birth control, only about 6 percent used IUDs, according to the latest data from the Centers for Disease Control and Prevention. The new guidelines, which replace an earlier set issued in 2005, appear in the latest issue of Obstetrics and Gynecology. Shots had a chance to chat with Dr. Eve Espey, one of the co-authors of the paper. Here are highlights from our conversation, edited for length and clarity. The public is more receptive to them now, and doctors are more receptive. And there's increasing evidence that point to how safe and effective they are. Evidence shows women who have not had children are better candidates. There has been less data on teens, but what's out there is reassuring. IUDs have been found to be quite effective in preventing pregnancy, yet there still is a stigma. Why is that? It's the plastic thingy. Women have concerns about a foreign object in their bodies. With so many choices for contraception, what makes IUDs worth considering versus the pill or another method? Most contraceptives require repeated maintenance in order for them to work, IUDs don't. The biggest risk with an IUD is that in rare cases it can poke a hole in the uterus and end up in the abdomen. It's not life-threatening and can be treated with surgery. If you get pregnant with IUDs, which is also rare — 1 percent — there is an increased risk of getting a miscarriage or an ectopic pregnancy, where the fetus is outside the uterus. But that can be treated medically with an injection or surgery to remove. How do your patients respond to recommendations about IUDs? In my practice, younger women are open to it. When you tell women about IUDs, they are often quite open to a method that has so few side effects and is virtually hassle-free. The initial version of this post said the contraceptive Implanon is an IUD. It is a long-acting contraceptive implanted under the skin.